The peanut plant (Arachis hypogaea L.) is grown mainly for its seeds, which are used either as food (snacks, peanut butter, etc.) or for their edible oil. After peanuts are harvested, aerial parts of the plant become available in large quantities and are used fresh or dried as a nutritious livestock feed in all peanut-producing countries. As with other legume crop residues, the terminology used to name peanut crop residues are numerous: they are called haulms, vines, tops, stover, hay or straw, depending on the country or local tradition. While these names may not always be exact synonyms (e.g. peanut hay can be made out of vegetative plants rather than from the mature plants remaining after the harvest), they are used quite interchangeably in the literature. In American English the term peanut hay often describes what is a typical crop residue, though it can also describe an actual hay. Peanut is an annual herbaceous plant growing to a length of 30 to 50 cm. The plant can be erect or prostrate with a well developed taproot and many lateral roots and nodules. The leaves are opposite and pinnate with four leaflets; each leaflet is 1 to 7 cm long and 1 to 3 cm across. The flowers are 1.0 to 1.5 cm across, bright yellow or yellowish orange with reddish veining. They are borne in axillary clusters on the stems above ground and last for just one day. One to several flowers may be present at each node and are usually more abundant at lower nodes. The first flowers appear at 4 to 6 weeks after planting, and maximum flower production occurs 6 to 10 weeks after planting. 8 to 14 days after pollination, a short stalk at the base of the ovary elongates to form a thread-like structure known as a "peg". This pushes the ovary down 5 to 8 cm into the soil, where it develops into a pod. Pods are 3 to 7 cm long, normally containing one to four seeds. Pods reach maximum size after 2 to 3 weeks in the soil, maximum oil content in 6 to 7 weeks, and maximum protein content after 5 to 8 weeks. The peanut crop matures after 7 to 9 weeks in the soil, which is indicated by maximum levels of protein, oil, dry matter, and presence of darkened veining and brown splotching inside the pod. Peanuts usually require a minimum of 100 to 150 days from planting to maturity depending on the variety. Flowering continues over a long period, and at harvest pods are in all stages of development. Pegs will eventually rot in the soil and the resulting loose pods are lost during harvest (Putnam, 1991). Peanut crop residues consist of leaves, stalks (vines) and remaining pods left in the field after the peanut harvest. There is a considerable variation in quality, depending on the harvest method, storage and on the proportions of plant materials included in the residue. Like other legume hays, peanut forage is subject to leaf shattering, which increases the proportion of stems and diminishes its nutritional value (Myer et al., 2010). Peanut crop residues can be fed fresh, dried or ensiled (Hill, 2002). Depending on the livestock production system, peanut crop residues can be used as a supplement or as a sole feed (Etela et al., 2011). 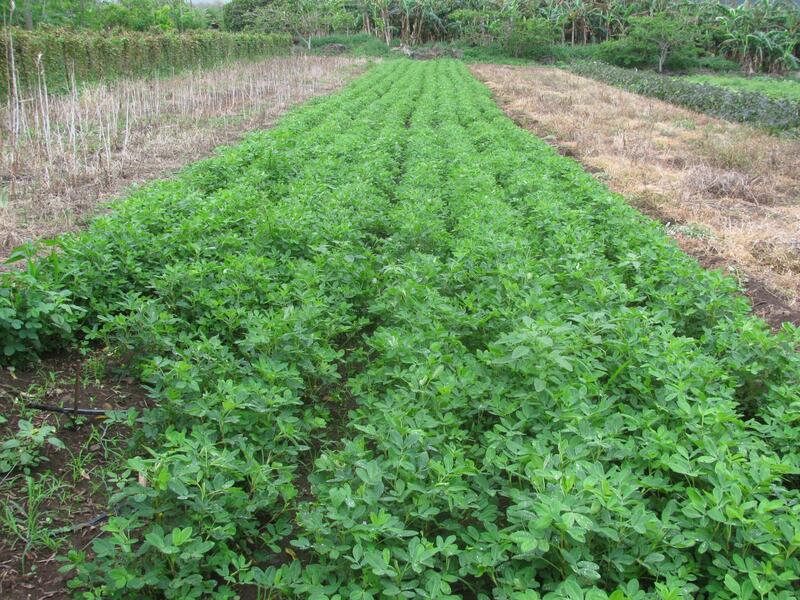 The peanut crop yields large amounts of good quality forage and is an important, and sometimes major, provider of fodder wherever it is grown. Dual-purpose peanut varieties capable of producing appreciable quantities of both grain (peanuts) and good-quality hay are being developed and disseminated in Africa and Asia (Etela et al., 2011). In the USA, peanut hay is produced throughout the peanut belt, and is fed as a winter feed supplement to growing stocker cattle, beef replacement heifers, and wintering cow herds. In autumn, if harvesting conditions are good, large amounts of peanut hay can be baled in a few weeks, and the production costs are cheaper than for grass hays. In drought years, peanut often becomes the primary hay source for cattle farmers. However, it is only made on 25 to 40% of the total peanut acreage, as many peanut producers, particularly those who do not have to feed cattle, forget hay production and incorporate the residual vines as organic matter (Hill, 2002). In West Africa, peanut haulms are extensively fed to ruminants, especially in the dry season. Smallholder crop-livestock farmers consider forage and seed value with equal weightings. In the subhumid zone of West Africa, farmers prefer late-maturing cultivars to early-maturing types as the former provide more forage for livestock. Furthermore, the sale of forage is a major source of household income (Larbi et al., 1999). Crop residues such as peanut or pigeon pea haulms have been shown to provide up to 80% of livestock feed in densely populated areas of Nigeria (de Leeuw, 1997). In the Gambia, peanut hay is the traditional feed resource of choice, especially in urban areas. It is transported into peri-urban livestock facilities, where it is used in zero-grazing systems during the dry season of about nine months (Asaolu et al., 2010). In India, peanut crop residues are widely used to feed livestock (NDDB, 2012). A study, conducted in villages with dairy enterprises in the Deccan Plateau, concluded that grains/pods and crop residues (sorghum and groundnut) almost equally contributed to the feed resource in mixed-crop livestock systems. In some villages, peanut hay comprised between 40 and 80% of the crop residues. In peanut-based crop-livestock systems, peanut hay was used for 8 months of the year in non-intensive dairy villages, and all year round in intensive dairy villages (Devi et al., 2000). Peanut is now rarely specifically grown for forage, as the seed crop is much more valuable, though this was common in the first half of the 20th century in the USA (Sheely et al., 1942; Gorbet et al., 1994; Myer et al., 2010). The rhizoma (or perennial) peanut (Arachis glabrata), a similar species that produces few seeds, is grown for this purpose (French et al., 2006; Hill, 2002). In the USA, there have been some promising efforts, but not yet conclusive, to use again peanut as a forage crop only (Myer et al., 2010). Peanut is native of South America. It was cultivated in Peru at least as early as 1500 BCE and probably earlier. The Incas used its seeds, which were eaten toasted, and its oil. After the arrival of Europeans in America, peanut was spread worldwide. An oil mill was established in Spain in 1800, and West Africa became the primary source of peanut exportation in the 19th century (Pattee, 2005). Peanut is now a major crop, widely distributed throughout tropical, subtropical, and warm temperate areas in Asia, Africa, Oceania, North and South America, and Europe (Freeman et al., 1999). In 2014, peanut cultivation covered 25.7 million ha worldwide, including 13.1 million ha in Africa (51%), 11.2 million ha in Asia (44%) and 1.3 million ha in the Americas (5%) (FAO, 2016). Peanut is cultivated throughout Africa, Sudan, Nigeria and Senegal being the main producers. In Western and Central Africa, peanut is cultivated in semi-arid areas. There a growing season of 75-150 days with an annual rainfall of 300-1200 mm is required. In Southern and Eastern Africa, peanut is also grown at an altitude of over 1500 m, with a rainfall of 300-1000 mm. In Asia, most of the production occurs in India and China, though peanut is also grown in Indonesia, Myanmar, Bangladesh, and Vietnam. In India, about 80% of the peanut crop is rainfed, and grown in southern, western, and parts of central India during the south-west monsoon. The remaining 20% is irrigated, grown in the post-rainy season and in summer in southern, eastern and central India. In China, peanut is grown in rotation with wheat and maize. 25% of the production comes from the Shandong province in northern China. Growing conditions are diverse, with rainfall ranging from 400 to 2000 mm, and 150 to 300 frost-free days per year. Argentina and Brazil together account for 66% of the peanut produced in Latin America and the Caribbean. The crop is grown mainly in semi-arid regions. In the USA, production is concentrated in the south-east, in the Virginia-Carolina area, and the south-west. In Europe, peanut is grown only in Bulgaria and small parts of Greece, Spain, and Yugoslavia (Freeman et al., 1999). Low-input systems. 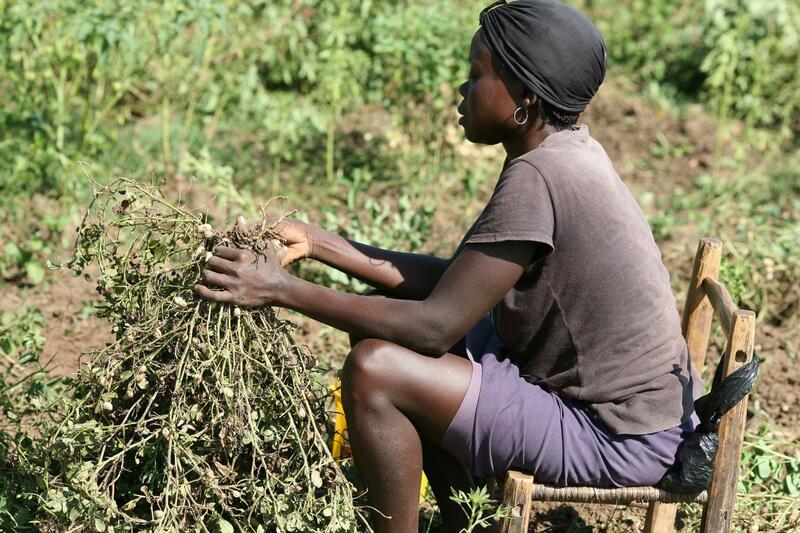 In most African and Asian countries, smallholder farmers grow peanut as a semi-subsistence crop, primarily for food. 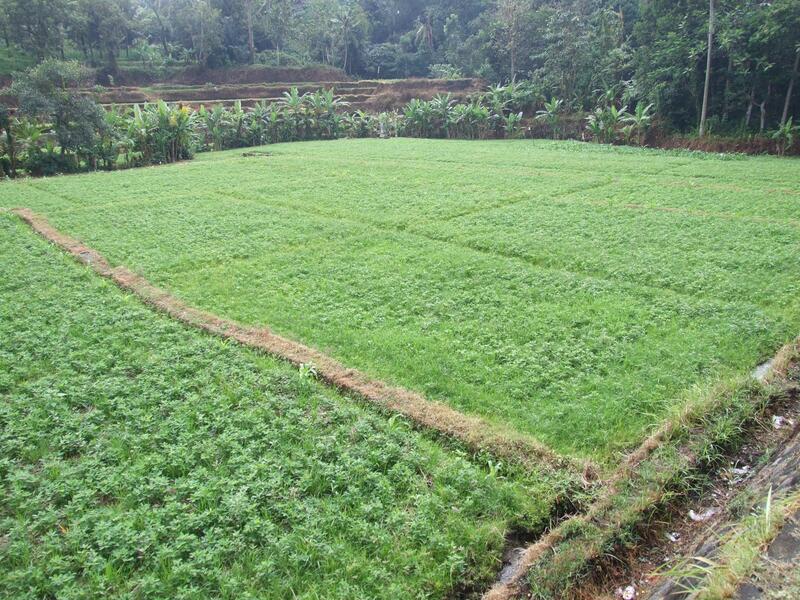 The crop is cultivated under rainfed conditions, with no inputs other than land and labour. It is subject to drought stress and to high levels of pest and disease infestation. Average seed yields are about 700 kg/ha and can vary substantially from year to year. High-input systems. In the USA, Australia, Argentina, Brazil, China and South Africa, peanut is grown for food and oil on a commercial scale using improved varieties, modern crop management practices, irrigation, and high levels of inputs such as fertilizer, herbicides, and pesticides. Farm operations are generally mechanized. Seed yields in these systems are considerably higher (2-4 t/ha) and more stable than in low-input systems. The production of good peanut crop haulms requires hot drying conditions. When harvested under moist conditions, peanut haulms may become a blackened, diseased mass that needs to be dried (Suttie, 2000). Ideally, harvest should take place when the leaves become yellowish and begin to dry. Once the nuts are dug up, the partly dried haulms may be stacked in small heaps. In Asia, the haulms may be dried on the farm, on house roofs and other sunny places protected from livestock, or stacked on stakes. Drying takes 3 to 6 weeks and then the crop is threshed (Suttie, 2000). Peanut hay is sensitive to moisture, and, in rainy conditions, it should be stored in a barn, baled in plastic wrapping, or fed to livestock as soon as possible (Hill, 2002). In the USA, green peanut plants are lifted from the soil and inverted to expose the roots and nuts to the sun for drying. After several days of drying, adapted combines harvest the peanuts from the pods. The timing between inverting and harvest is critical to hay quality: prolonged rainfall after harvest, delayed harvesting or too high a moisture content in the vines are detrimental to hay quality. In addition, mechanical harvesting displaces considerable amounts of soil that adhere to vines and leaves, resulting in a higher mineral content (Hill, 2002). 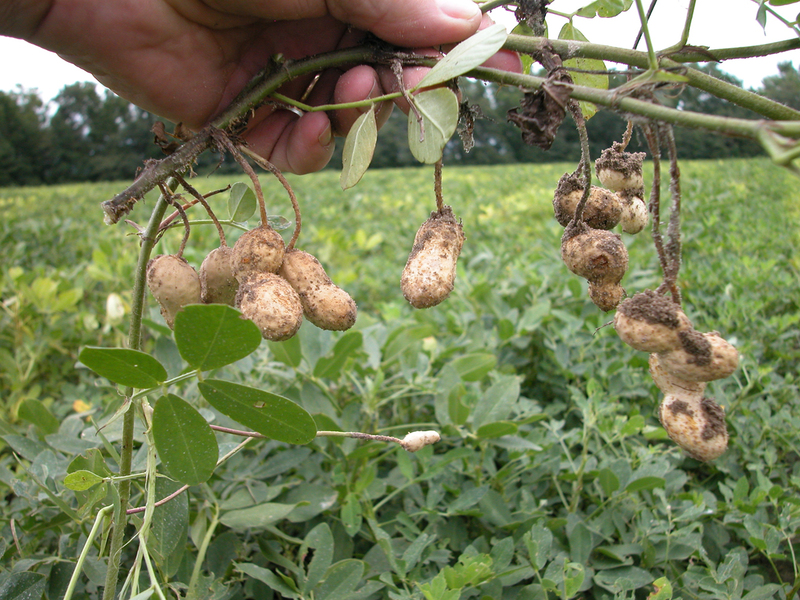 Like other legume crops, peanut cultivation helps to improve soil fertility through biological nitrogen fixation, and can thus contribute to significant improvements in the sustainability of cropping systems (Freeman et al., 1999). Peanut crop residues have a very variable composition, which is conditioned by the respective proportion of leaves, stems and residual pods. 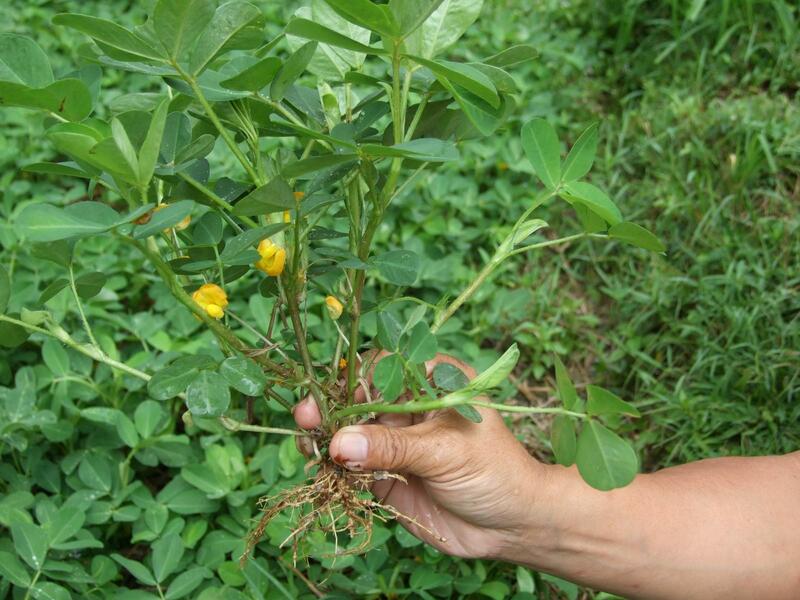 Protein content is relatively low for legume forage, on average about 10-12% of DM, ranging from 6 to 17%. Fibre content is high, with crude fibre ranging from 15 to 51% of DM and lignin content averaging 10% of DM. Leaf shattering, which decreases the leaf:stem ratio and thus the nutritional value, is often significant when peanuts are harvested mechanically (Hill, 2002). Different combines also result in differences in hay, including stem length and quality (Hill, 2002). Ash is also relatively high (average 10% of DM with values up to 20% of DM), which can be expected from crop residues that include underground parts. 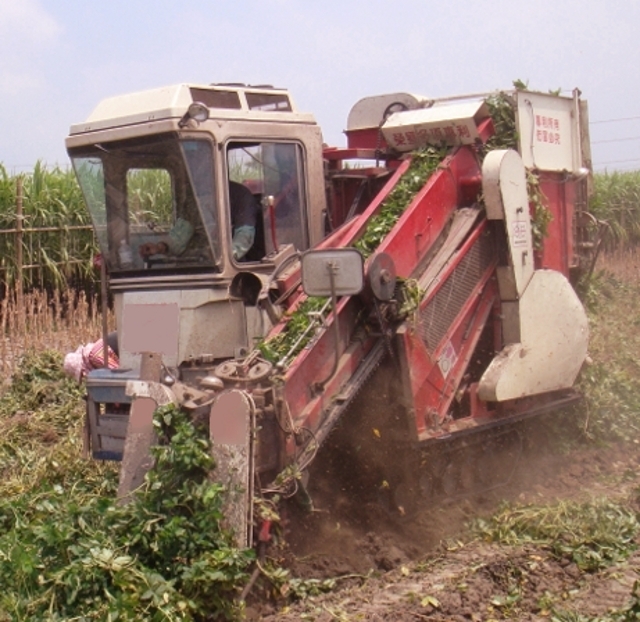 When peanut harvest is highly mechanized, the crop residue can be particularly high in ash (Myer et al., 2010). Whole peanut forage, which includes the nuts, contains more protein (15-16% of DM) and more lipids (about 13% of DM) than the crop residues (Johnson et al., 1979). Like other peanut products, peanut crop residues can be contaminated by the fungi Aspergillus flavus and Aspergillus parasiticus, and may, therefore, contain potentially toxic concentrations of aflatoxins (see the Peanut meal datasheet for a more comprehensive discussion of aflatoxin contamination). There have been several reports of lethal aflatoxicosis occurring in cattle fed peanut hay. In Australia, 12 drought-stricken calves died after being fed peanut hay. Most of the aflatoxins were concentrated in the residual pods (McKenzie et al., 1981). In the USA, 125 adult cattle fed peanut hay died of an acute respiratory distress syndrome (Roberson et al., 1997). Though these incidents are uncommon, it is recommended to ensure that peanut haulms are well-preserved and free of mould, particularly if the hay was harvested after heavy rains and not dried sufficiently (Hill, 2002). Fungicides used in peanut production may not be cleared for the feeding of peanut hay, making the feeding of peanut hay containing residues of those fungicides illegal in some countries, including the USA (Myer et al., 2010). Early literature, from when peanut was grown as a forage crop, raised the risk of scouring in cattle fed too large quantities of the forage containing pods (Göhl, 1982). This risk is minimal today since livestock are fed crop residues rather than whole mature plants. Occasional cases of rumen compaction have occurred when beef cows consumed too much peanut hay in a short period of time (Hill, 2002). Peanut crop residues are a common ruminant feed in peanut producing countries. They are generally considered as having the nutritional value of a good grass or alfalfa hay (Hill, 2002). In Nigeria, a survey of peanut crop residues concluded that their protein content, higher than that of cereal crop residues, could effectively provide supplementary nitrogen to ruminants offered diets of low N cereal crop residues, especially during the dry season (Larbi et al., 1999). Peanut haulms have a moderate to good digestibility and energy value. In India, in a survey of 860 peanut haulm samples, the average in vitro OM digestibility was 56%, ranging from 52 to 61%. The average ME value (estimated by the gas production method) was 7.9 MJ/kg MD, ranging from 6.9 to 8.9 (Blummel et al., 2005). Experiments in the USA have shown that good quality peanut hay fed to lactating dairy cows resulted in total feed intake, hay intake, and milk production similar to that obtained with alfalfa hay (Ronning et al., 1953; Hawkins et al., 1957; McBrayer et al., 1981). In the USA, diets containing 50% (DM) of whole plant (including the nuts) peanut silage were consumed readily by growing dairy heifers. Protein and lipid digestibilities were higher than with all maize silage diets, indicating that whole plant peanut silage could be used in cattle diets as a roughage supplying relatively high amounts of protein, energy, and fibre. Treatment of chopped peanuts with propionic acid-formaldehyde preservative did not affect animal responses (Johnson et al., 1979). In the USA, residual peanut hay is widely used to feed beef cattle (Hill, 2002). A comparison of peanut hay and Bermuda grass (Cynodon dactylon) fed to growing heifers found that Bermuda grass gave better average daily gain, but that the lower results of the peanut hay were due to its large mineral load (McBrayer et al., 1981). In the USA, a grazing study with early weaned beef calves found that peanut pasture was initially an excellent forage, but that the lack of regrowth and declining forage quality resulted in lower growth rates in the later grazing periods. The short grazing season and lack of regrowth after grazing in a rotational grazing system would limit its value as a pasture crop (Myer et al., 2010). In tropical countries, most feeding trials focus on determining the best strategy for using peanut crop residues as a supplement for nutritionally poor sheep diets (Etela et al., 2011). In Nigeria, the nutritional quality of stover from the six dual­-purpose peanut cultivars fed as sole diets to West African dwarf sheep supported adequate nutrient intake, digestibility, daily live-weight gain and nitrogen balance. However, using them as supplements to poor quality roughages during the dry season might be preferable, because their use as sole diets appears to require more feed per animal (Etela et al., 2011). In India, growing lambs were economically fed a complete diet containing up to 40% peanut haulms, though the highest daily gain was obtained with 20% haulms (Durga Prasad et al., 1986). In Niger, when Peul Oudah rams were fed up to 450 g/d of peanut haulms with ad libitum bush hay, increasing levels of haulms led to higher average daily gain, but the gain remained too low to be profitable. It was suggested that a source of energy, such as millet bran, was added to the diet to improve both growth rate and profitability (Ayantunde et al., 2007). The supplementation of the diets of Oudah male lambs with peanut haulms had a positive effect on intake, weight gain and feed efficiency. It was suggested that, in the dry season, it is practical to supplement sheep with low levels (200 g/d) of peanut haulms together with a low level of bran to support moderate gain. When feed is plentiful, it may be more suitable to supplement with 400 g/d of peanut haulms, in association with moderate levels of bran, to allow acceptable growth performance in male lambs (Abdou et al., 2011). In the USA, a comparison of different legume hays for lambs found that peanut hay (mature whole plant) from both annual and perennial species gave a better performance than the hays from sobyean, cowpea (Vigna unguiculata) and pigeon pea (Cajanus cajan) (Foster et al., 2009). In Zimbabwe and Nigeria, peanut crop residues met the maintenance energy requirements of adult goats, even at increasing levels of dietary inclusion (Ndlovu et al., 1995; Malau-Aduli et al., 2003). In India, groundnut haulms, included in the diets of indigenous pigs at 20-30%, replaced maize grain without adversely affecting the growth, intake, feed conversion efficiency and carcass characteristics (Rao et al., 1989). In Vietnam, fresh peanut vines fed to growing pigs had a digestible energy content of 7.8 MJ/kg DM (Bui Huy Nhu Phuc, 2006). Peanut crop residues are rich in fibre so their value as a feed for poultry is limited and they can only be used in small amounts. In India, the incorporation of peanut haulms at 6% of the diet for broilers partially replaced maize and soybean meal without any harmful effects on feed intake, growth and feed conversion ratio (Ribadiya et al., 2015). In tropical countries peanut crop residues are frequently fed to rabbits, in addition to a concentrate (Iyeghe-Erakpotobor et al., 2009; Nwagu et al., 2010; Osei et al., 2012), or included in a complete diet (Aduku et al., 1986; Rao et al., 1986; Gongnet et al., 1998; Li et al., 2012). In complete diets, the incorporation level is frequently in the 20-30% range (Rao et al., 1986; Njidda et al., 2011; Gongnet et al., 1998), but in some cases it has been increased successfully up to 40-50% (Aduku et al., 1986; Muir et al., 1996; Farinu, 1994; Iyeghe-Erakpotobor, 2012). The effectiveness of the inclusion of peanut haulms in rabbit diets depends mainly on their quality, including leaf:stem ratio, drying conditions and contamination with aflatoxins. In different studies, peanut haulms replaced up to 50% of the concentrate without alteration of growth or slaughter performance (Ngodigha et al., 1994; Alli-Balogun et al., 2003). Peanut haulms have also completely replaced alfalfa hay (Oyawoye et al., 1990) or berseem hay (Ibrahim, 2000) in complete diets. Fresh peanut foliage is willingly consumed by rabbits (Adehan et al., 1994; Iyeghe-Erakpotobor et al., 2008). This forage containing 16-17% protein and 20-25% crude fibre (in the DM) is effectively used, with the addition of a concentrate, to feed rabbits in several countries, including Nigeria, Java and China (Carew et al., 1989; Prawirodigdo, 1985; Pu et al., 1990). Ensiled peanut foliage used in addition to a concentrate gave better reproductive performance and higher milk yield than pressed sugarcane stalk or dried pangola grass (control), as a consequence of its higher consumption: 193 g/d vs. 25-35 g/d for the other forages (Nguyen Quang Suc et al., 1995). In a comparison of annual (grown for forage) and perennial peanut forage, annual peanut hay was found to have thicker stems and to be very dusty, and, therefore, eaten reluctantly by horses. Peanut forage was best recommended as silage/haylage or as a grazed legume because of the losses in nutritive quality during harvest and storage (Eckert, 2008). In Mexico, diets of juvenile Nile tilapia included up to 20% peanut leaf meal protein (31% of the diet) as a partial replacement for fish meal without significant negative effects on fish growth and health (Garduño-Lugo et al., 2008). Alhassan, W. S., 1987. Studies on untreated crop residue utilization in Red Sokoto (Maradi) goats. Goat production in the humid tropics. Proc. Workshop, University of Ife, Ile Ife, Nigeria, 20-24/7/1987, Smith, O.B. ed. Freeman, H.A. ; Nigam, S. N. ; Kelly, T. G. ; Ntare, B. R. ; Subrahmaniyam, P. ; Boughton, D., 1999. The World groundnut economy: facts, trends, and outlook. Patancheru 502 324, Andhra Pradesh, India: ICRISAT, 52 pp.